Join the many 20/20 Vision Partners who partner with Southeastern by giving monthly or annually. These special donors make a Christian education possible for many students. These students are our future pastors, missionaries and teachers. Thank you for your partnership! Go to www.sfwbc.edu/support/ and join the many faithful partners who faithfully support the ministry of training our future leaders. We need your help! Legacy Giving! As you end the year and plan for the next, you may be interested in remembering your charities in your end of life planning. We invite you to become a member of the Compass Rose Legacy Society. 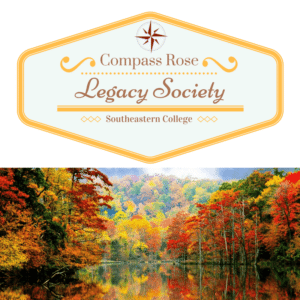 Join our Compass Rose Legacy Society by remembering Southeastern in your end of life planning.